In previous blog posts, we have talked about the new trend in alarm monitoring, which is referred to as “interactive alarm monitoring”. This form of monitoring allows you to remotely manage and control your security system from your phone, tablet or PC all with the peace of mind that you have a security system which is being professionally monitored. The big difference between these types of security systems and a “do it yourself” system like Google’s Nest is that “interactive” services like those through alarm.com allow you to have all of the flexibility of a system like Google Nest, but the comforts that come with a professionally installed a monitored system. Systems are which are installed by people who are trained through programs like CANASA’s ATC program, and monitored by professionally trained dispatchers are less prone to false alarms and leave you with the peace of mind that no matter where you are you security will be taken care of. Interactive services, like Alarm.com, bridge the gap between “do it yourself” systems and professional system, placing command and control at your fingertips. The main problem to date has been that in order to take advantage of these types of systems, you needed to think about upgrading your older alarm systems to make them compatible with these newer services. Those times, thankfully, are over. 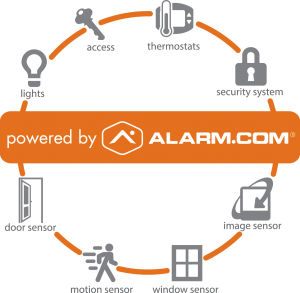 Now, if you have a DSC Power Series 1616, 1832 or 1864 security system installed in your business, you can probably take advantage of the Alarm.com platform through the new ‘System Enhancement Module’ or SEM. The SEM integrates with these alarm panels, as long as you have version 4.1 of this panel or higher. Version 4.1 or higher of the DSC Power Series 1616, 1832 and 1864 security alarm system has been around for at least 10 years, so the likelihood of you having one of these systems installed in your business is pretty good. • Live and Recorded Video. The equipment is easy to install and should only take about an hour to hook up (depending on the size of your system, of course. If You have multiple locations, using Alarm.com can also help you better manage the systems in these locations, allowing you to get real time reports from each site, change user codes quickly and easily and more. Adding an SEM to your existing multi-site business with DSC Power Series security equipment installed can make management of the security of your businesses that much easier. For more information in the Alarm.com System Enhancement Module (SEM) for DSC Power Series PC1616, PC1832 and PC1864, contact us. We’ll provide a real-time demo of the alarm.com platform and show you how the SEM can be a valuable addition to your business security.